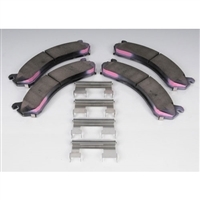 AC Delco OE Factory Rear Parking Brake Shoes 01-10. One order is 2 shoes that is enough to do one side only. If doing both sides you need 2 orders (to complete both sides of the parking brake shoes). THESE ARE THE CLOSEST MATCH IN A SEMI METALLIC PAD TO THE AC DELCO FACTORY PAD.